If you are looking for some beautiful jewelry to buy for some holiday gifts, then what better place to look than BARE AND ME! We have statement pieces, rings, earrings, and necklaces, all which can be made more sentimental with the initials of your loved ones. We have recently been coming out with a lot more pieces, and we are so excited about them! 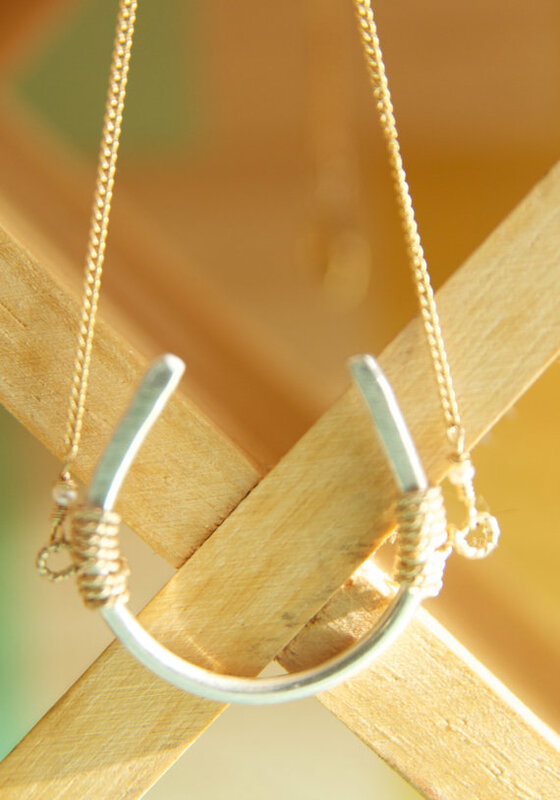 One of our favorites at the moment is our handmade Mixed Metal Horseshoe charm necklace which comes in Sterling Silver and Gold. We love to mix silvers and golds so that our jewelry can be worn with anything. Many have layered our necklaces to make more of a statement and they always look so wonderful! Here you can see the mixture of silver and gold and it looks absolutely wonderful! Now you do not have to worry about taking off your favorite silver ring because you are wearing a new gold necklace. We are really big into effortless beauty here at Bare and Me. You do not have to be so matchy matchy to look beautiful in something you are wearing. By mixing the gold and the silver, we want you to have the same effortless look as this beautiful piece. Go check out this piece on Etsy.com, and all of the other beautiful jewelry we have to offer. It would be such a great gift for the Holidays!